The ODDLYIELD function is one of the financial functions. 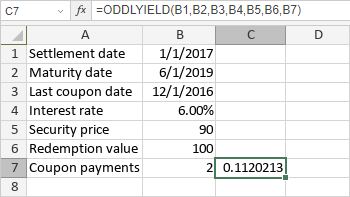 It is used to calculate the yield of a security that pays periodic interest but has an odd last period (it is shorter or longer than other periods). settlement is the date when the security is purchased. maturity is the date when the security expires. last-interest is the last coupon date. This date must be before the settlement date. rate is the security interest rate. pr is the purchase price of the security, per $100 par value. redemption is the redemption value of the security, per $100 par value. frequency is the number of interest payments per year. The possible values are: 1 for annual payments, 2 for semiannual payments, 4 for quarterly payments. Note: dates must be entered by using the DATE function. The values can be entered manually or included into the cell you make reference to.